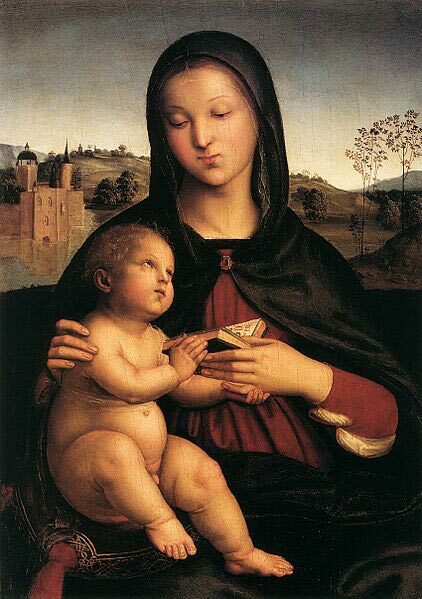 Raphael Sanzio was credited for the painting of Madonna & Child with the Book. The medium used for the artwork is oil on panel. It measures fifty five and a half centimeters by forty centimeters. Raphael through this work has created somewhat of a meditation art piece. It is a serene painting with a simple and natural beauty. The spatial arrangements also help to tie up everything in an organization that so depicts the kind of master Raphael is. The central figure is the Madonna with the child held in her arms. The silhouette simply frames the Mother Mary figure as well as the book. The book inscription is in fact the commemorative Nones that honors the Crucifixion and death of Christ.